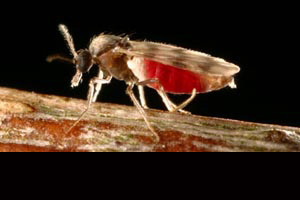 Culicoides biting midges are behind the spread of the bluetongue virus. American researchers have discovered how a livestock virus closely related to the pathogen behind African horse sickness manages to survive through the cooler months. They monitored cows and tiny gnat-like biting midges on a Northern California dairy farm to discover where the bluetongue virus hides during the winter. The bluetongue virus causes a serious disease that costs the cattle and sheep industries in the United States an estimated $US125 million annually. Veterinary scientists at the University of California, Davis, found that the virus manages to survive the winter by reproducing in the insect that transmits it. The findings, published in the open-access journal, PLoS ONE, solve a century-old mystery and are particularly significant as global climate change brings more moderate winter temperatures around the world. The disease mostly sickens sheep but also infects cattle and goats, as well as deer and other wild ruminants. In the US, its greatest economic impact is in the cattle industry, because it is bigger than the domestic sheep industry and most adversely impacted by international trade barriers related to bluetongue. The disease does not pose a threat to human health. The virus that causes bluetongue was first isolated and identified in the Western Hemisphere in the early 1950s at the University of California, Davis, School of Veterinary Medicine. In California, bluetongue is most prevalent when midges are abundant in late summer and fall, but there has been speculation over how the virus survives through the winter. When temperatures turn cold and the biting-midge populations plummet, transmission appears to cease for more than six months, but the virus reappears when temperatures warm the following season. The bluetongue virus was widespread in both the dairy cows and the midges from August to November. However, surprisingly, the researchers discovered that the virus was also present in female midges captured in February of both 2013 and 2014. There was no sign of infection in the dairy cattle being studied. The researchers concluded that those long-lived female midges had been infected with the bluetongue virus during the previous warm-weather season. They were carrying the virus through the winter months and would, later in the season, once again transmit it to cows on the dairy. Other members of the research team were William Reisen and Cameron Osborne, both of UC Davis; Paul Gibbs of the University of Florida, Gainesville; Bradley Mullens of UC Riverside; and Ian Gardner of Atlantic Veterinary College, Charlottetown, Prince Edward Island, Canada. Funding for the study was provided by the US Department of Agriculture’s National Institute of Food and Agriculture, and the UC Davis School of Veterinary Medicine’s Center for Food Animal Health.